I don't really understand what this does or its value but it's super creative and interactive: "Uniqlo have a new weather calendar site the tells you the weather where you are in tilt-shift miniature." 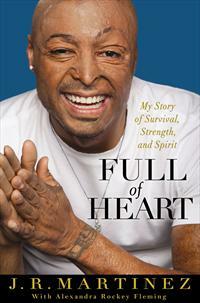 Full of Heart: My Story of Survival, Strength, and Spirit is the inspiring true story of actor, motivational speaker, and former U.S. Army soldier, J.R. Martinez. Full of Heart chronicles Martinez's incredible, and uniquely American journey through poverty, hardship, and tragedy, to his rise as a hero and media darling. The inspiring true story of actor, motivational speaker, and former U.S. Army soldier, J.R. Martinez, Full of Heart chronicles Martinez's incredible, and uniquely American journey through poverty, hardship, and tragedy, to his rise as a hero and media darling. Full of Heart is an intimate and inspirational chronicle of J.R. Martinez's life story. Martinez recounts his childhood in the South as the son of a single mother, a Salvadoran immigrant struggling to make ends meet. At the age of 17-showing the determination and drive that would become his trademark-Martinez convinced his mom to move to Georgia, where Martinez believed he would have a better chance of being recruited to play college football. But when Martinez's football dreams collapsed and he didn't have the financial resources or grades to attend college, he turned to the U.S. Army and soon found himself serving in Iraq. In April 2003, at 19 years old, Martinez's Humvee hit a landmine and he suffered severe smoke inhalation and disfiguring burns to over 40 percent of his body. Martinez was sent to the Army Burn Center in San Antonio, where he spent the next 34 months in grueling recovery. During this time, Martinez shared his experiences with other patients and listened to theirs. His fellow soldiers, along with the local and then national media, soon latched onto Martinez's inspiring personality, leading to a career as a popular motivational speaker, daytime television star, and Dancing with the Stars contestant. Full of Heart is Martinez's entire and yet untold story-one that will attract his large fan base, as well as the many others who will find both his life and story utterly accessible and appealing. Martinez's memoir of triumphing over extraordinary obstacles through pure resilience, optimism, and strength of spirit will inspire legions of people. In Reaching for the Stars: The Inspiring Story of a Migrant Farmworker Turned Astronaut, José M. Hernández tells offers his very own narrative on becoming the first Mexican-American astronaut in the history of the space program. Born into a family of migrant workers, toiling in the fields by the age of six, Jose M. Hernàndez dreamed of traveling through the night skies on a rocket ship. REACHING FOR THE STARS is the inspiring story of how he realized that dream, becoming the first Mexican-American astronaut. Hernàndez didn't speak English till he was 12, and his peers often joined gangs, or skipped school. And yet, by his twenties he was part of an elite team helping develop technology for the early detection of breast cancer. He was turned down by NASA eleven times on his long journey to donning that famous orange space suit. I've been sitting on several chapters of my unpublished, unfinished novel for years now. It's been so long that I've had to transfer the lengthy file to a new computer every couple of years to assure it's safety. Two months ago, I moved to a larger apartment where I now have my very own study/boudoir, which serves as my library and dressing room. My boyfriend jokingly refers to it as my "Lady Room" the foil to his "Man Cave." Before I moved in, I had visions of hours-long writing stints surrounded my by art, books, and lovely things but in reality, I've had little time to spend in there at all. It came to me that perhaps the best bet to finish my book would be during a pregnancy - giving birth in more ways than one. It's gotten to the point where I now have THREE great ideas for a book: one fictional and two, nonfiction. The latter two are no more than aspirational concepts and sometimes I wonder if I should just go ahead and query an agent now and worry about completing all three later but then I reign myself in. I want or need the timing, no, everything to be right because I know each one will be a success. This is an outline J.K Rowling used while writing. Since it's National Novel Writing Month, I've seen a lot recently on getting that book finished or published. Some of the articles like this one on how to use an Excel Spreadsheet to outline your novel or Designing your story with the use of a snowflake fractal, I'll be quite honest, simply turn my stomach. Is that really the best way to write a book? Is there a recipe, blueprint, secret sauce to doing this and doing it repeatedly? I remember reading this article on James Patterson's formula and thinking, well, that's one way to do it. I've gotten in the (very bad) habit of just being in the mercy of my muse. When she beckons I follow, for hours if need be and when she doesn't, I let her be and I know that's probably not the best way to get where I want to go. On a walk home recently, I thought to myself, wouldn't it be grand if I could write and publish a book every year for the rest of my life. I think back to the all the teachers and supporters who thought I would be a published author before I hit twenty sometimes and I feel as if I have failed in some way. I know I haven't but we all deal with our little doubts and demons. I know am not the only creative person out there with ideas and projects everywhere and no time to bring them into being. How do you deal with this sort of thing? Do you have any advice for me? - What Happens to a Cashless Society During an Event Like Hurricane Sandy? - Speaking of Dulce: Don't miss your chance to 'Send an Abrazo with Nestle' via Facebook on behalf of Nestlé ® Abuelita ™ and receive a Nestle Abuelita Kit w/ Coffee Mug & Samples *1st 500 for Next 9 Weeks - Starts Mondays at 1pm EST. Enter here. - Check out Esta Vida Boricua [This Puerto Rican Life]. Esta Vida Boricua is a digital life-narrative installation, spoken history archive, and public performance space, which focuses on the ancestral stories of Puerto Rico and its diaspora. - Help promote Las Comadres' first book, Count on Me, essays on fierce friendship by Latin@ authors. If you'd like to participate in upcoming book tour send an email to info@condorbook.com, by this Sunday Nov 18th! - El Gran Combo de Puerto Rico released a new 42-track compilation, the Greatest Christmas Hits of The Last Half Century – Patria, Tradicion & Navidad. Go to iTunes. You are cordially invited to participate in Comite Noviembre's First Annual Book Expo to take place at Comite Noviembre's Artisan Fair. 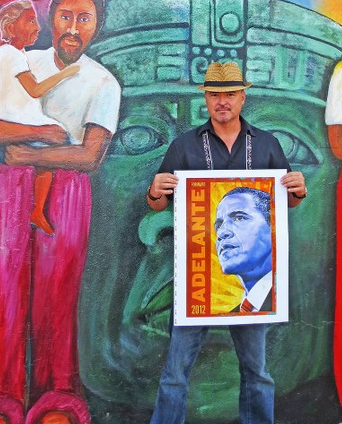 The artisan fair is the largest Puerto Rican artisan fair in the US!!! FREE to the public! 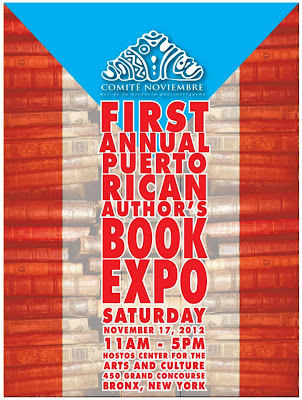 Taking place Saturday, November 17, 2012, at Hostos Community College! The Artisan Fair & Exhibit was established in 2006, in celebration of Comité Noviembre's, 20th anniversary. Over 50 artesanos puertorriqueños from throughout the US and Puerto Rico participated and the event boasted an attendance of over 5000 people in this very first Fair. 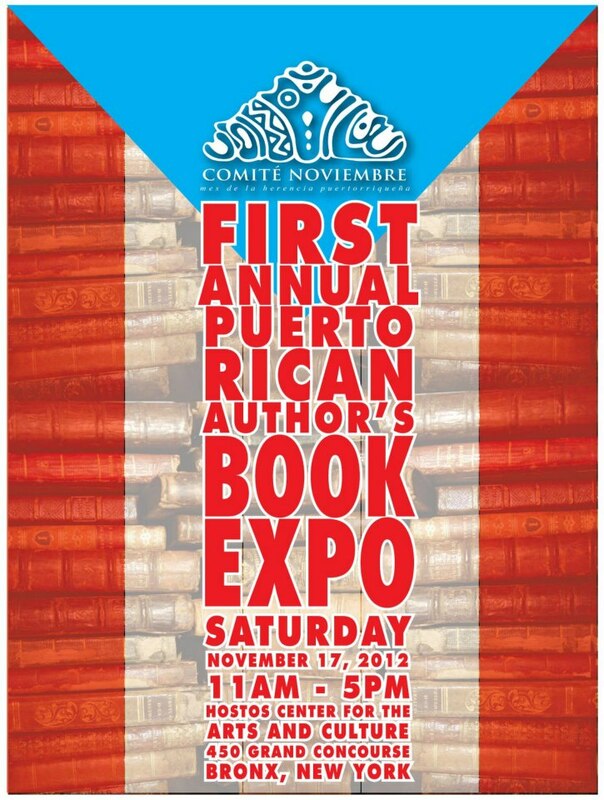 The Book Expo will add more culture to an already established tradition in the NY Boricua community. The Expo take place at the bridge that spans the Grand Concourse on the 2nd floor, adjacent to the gym where the majority of the artisans will be set up. RSVP here. Last week, we came home to discover a little sparrow had someone gotten trapped in our house. Our Siamese kitty was quite distraught at the intruder, who had wisely taken refuge behind a tall dresser in our bedroom. The extremely strange thing about our little visitor was that we had no idea how he found his way in the house. We discovered him after Hurricane Sandy but one day before the Nor'Easter and all of our windows were locked and closed. We thought perhaps he might have found his way in through small openings within the house and in through the radiator and such but really we haven't a clue. After much shooing and waving our hands at the poor frightened fellow, we managed to persuade him out the window before Kitty took matters into her own hands. I couldn't help thinking of the The Bird Omen Wives Tale which perceives this sort of visit to be a harbinger of very bad luck but I found it interesting that some think of this as a sign of good luck too. - A list of Brave Thinkers - 2012 The Atlantic edition. - The Economist looks at one way in which 3D printing could improve the everyday lives of people in poor countries here. - Dunkin' Donuts has launched a free, customized music shop tab on the Dunkin' Donuts Facebook page (http://umusic.ly/DDMusic), allowing fans a complimentary download (while supplies last) from among 10 pre-selected tracks from this year's hottest nominees of Latin music's big night, Noche de Estrellas. Last month, I had the opportunity to visit Amsterdam, Netherlands, for over a week. It was a rough week, my mom had been hospitalized the week before and I was there for a conference so I had no choice but to carry on. However, I still managed to walk around and see a few of the great sights of the historic town. I would definitely say the trip was worth it just for the food. Whomever, said Dutch food wasn't great, was so wrong! The cheese and the butter alone were unlike any thing I have ever tasted. Every place we went to eat served fresh food so expect a little bit of a wait at your table but the food will reward your patience. Also most shops and restaurants have resident cats so don't be surprised if one stops by your table while your dining. While there you must try the pannenkoeken or pancakes, they have almost every kind imaginable. I tried banana, bacon pancakes and ended up going to the supermarket to buy my own jar of suikerstroop or molasses which is used as the pancake syrup. Stroopwafels, or thin waffles sandwiched among cinnamon-spiced syrup, make excellent souvenirs to bring back home and you can purchase them pretty cheaply at the Albert Heijn's local supermarkets, for 1-2 Euros or 3-4 for a cute tin. The frites or fries are pretty popular and are served with mayo but they're pretty heavy so I advise you think of your tummy beforehand. Bitterballen (deep fried croquettes), were new for me, but quickly became a favorite snack, especially the curry flavored ones at the Hilton Amsterdam. Amsterdam is lovely for walking but not much for shopping. Most of the things I wanted to bring home were hard to although I did buy Gouda cheese and flower bulbs in the airport to bring home - make sure you get the kind that have a certificate of inspection sticker on them. My neatest finds were at the Waterlooplein Markt, one of Amsterdam's centrally located Flea Markets. I purchased an awesome vintage metal box and a sitting Buddha statue for 35 Euros. One of the coolest shops I visited had a really wide selection of Asian art notebooks and other chatkies that I had to resist buying. The Asian Spirit shop has a website here and I can't visit it without feeling regret over not getting notebooks to bring back. If you are there for a few days, you might want to check out Stuff Dutch People Like because it will make you laugh. It's funny because I got a real sense of New York's Dutch roots and also the influence of the Dutch within Caribbean culture. One of my favorite breakfast foods there were the delicious cod fritters, which reminded me of my mom's bacalaitos. Another thing that really impressed me was the diversity and open acceptance of other cultures and peoples, it was unlike anything I've experienced in Europe or even New York. On the flight home, I ended up sitting next to an ex-patriot who now teaches journalism and film in Amsterdam. The crazy part of this was that he attended my alma matter, Hunter College, and grew up in the same town in New Jersey, as my boyfriend. The world is a small place my friends - a small but wonderful place. Now about my box? Should I clean it or try to polish it up? I have a suspicion it's a gun box but that key is way too pretty. What do you think it was used for? Read more my Travelogue from Zurich, Switzerland here and check out Marisel Vera's blog about her travels in Zurich. Siempre Pa'lante, nunca para a'tras.